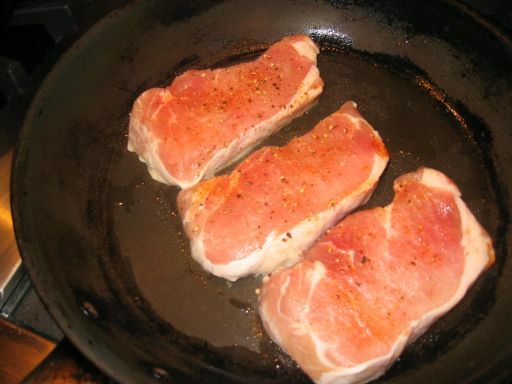 It has been a while since I prepared some pork chops for dinner. 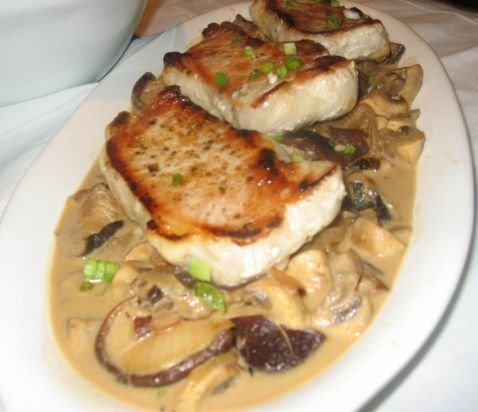 I love pork chops when they are cooked properly, meaning that when you cut the meat you can see that see that the inside is juicy and tender. 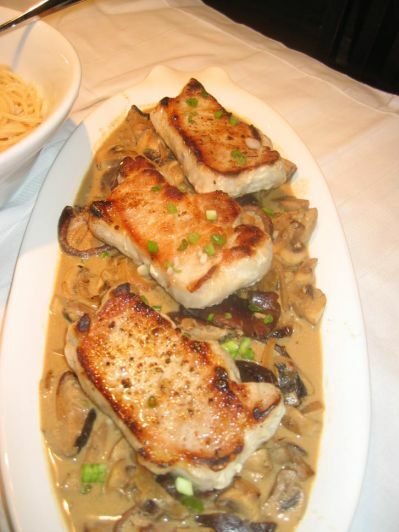 Pork chops can be tricky to cooked! 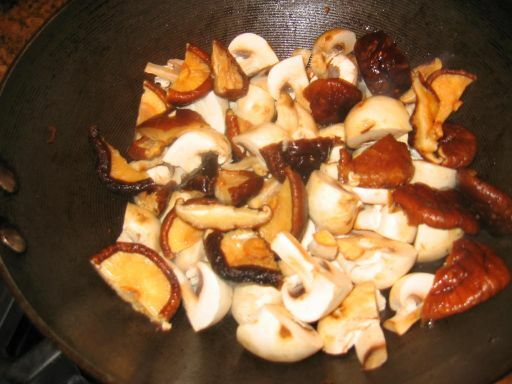 if you overcooked them they will taste like a piece of rubber, dry and tasteless. 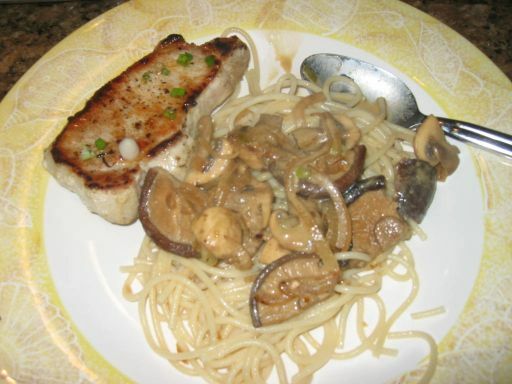 Tonight I decided to make some pork chops with a mustard mushroom sauce. 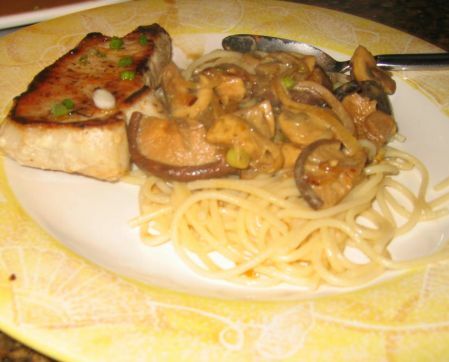 I am using button mushroom, shitake mushroom, caramelized onion, and Dijon mustard for the sauce. This dish took me about 20 to 30minutes from start to finish, which is something I can easily manage on a week day. 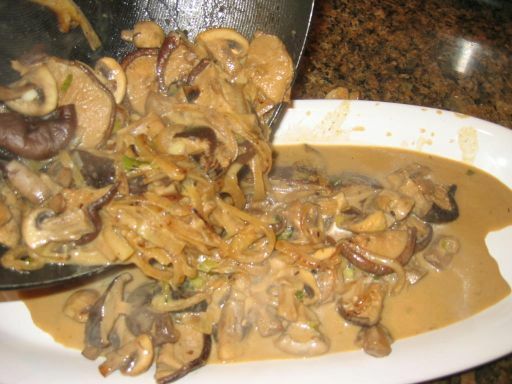 I have to tell you that the Shitake mushroom added a wonderful and strong flavor, the caramelized onions added a sweetness to the dish and the mustard just heightened the flavor of the sauce and also gave it a little tang. Setting up the table! 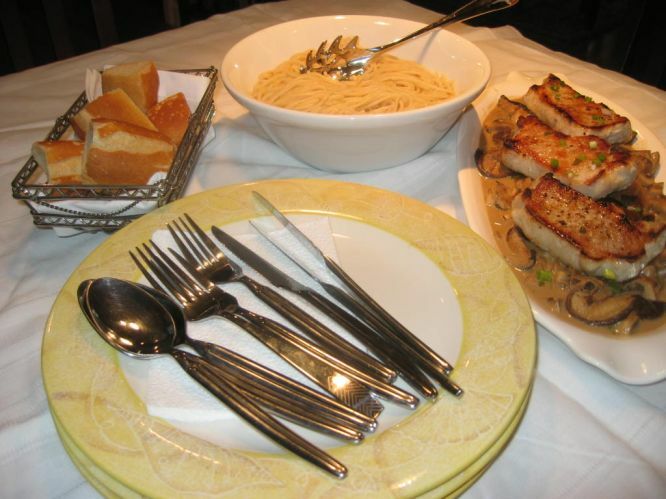 I also served some toasted bread to soak up all the sauce and a plate of garlic and butter spaghetti. Closer look at the dish. Doesn't it look delicious? We are now ready to eat! Yum! 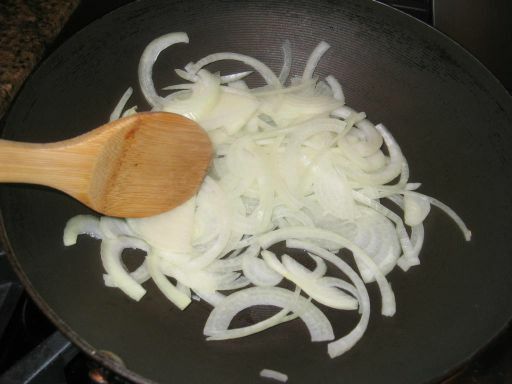 In a large skillet I am browning the onion until they are caramelized. 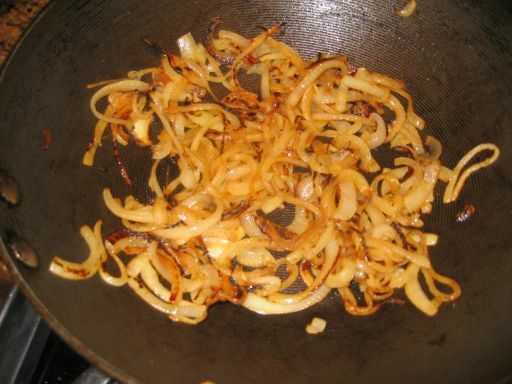 The onions are now caramelized and set aside. 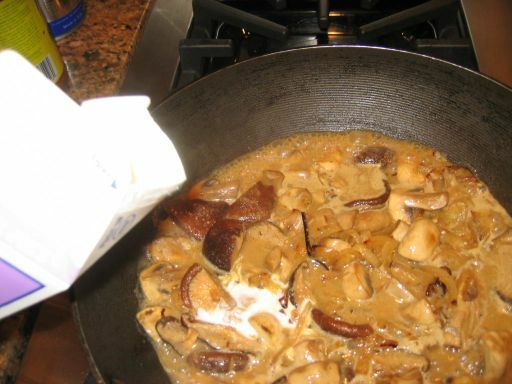 The button mushroom and the shitake mushroom are added to the hot skilled until all the juices are released. 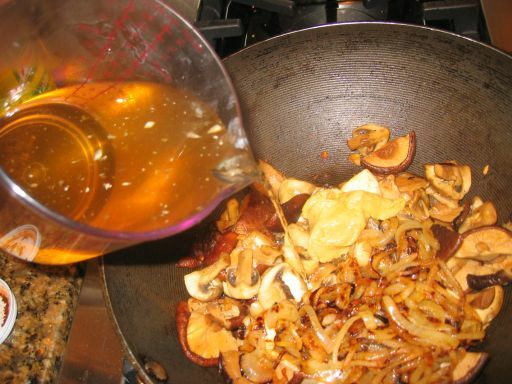 Now that the mushrooms are cooked, I added a large spoon of mustard, the caramelized onions, and poured some chicken broth inside the skillet. 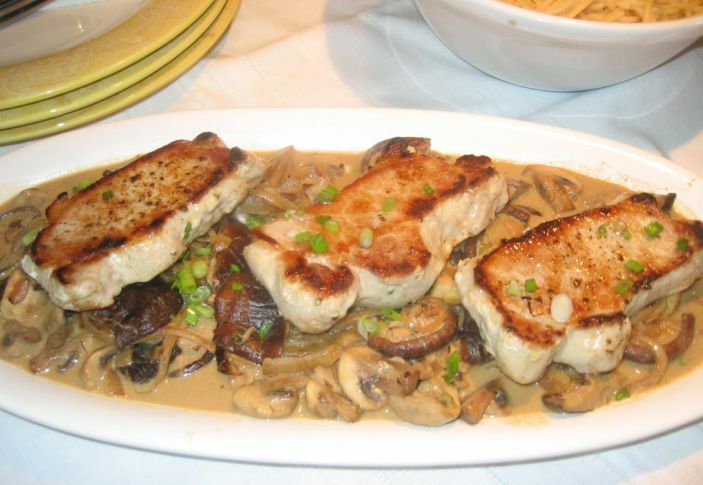 A little cream is added to thicken the sauce and then put aside until the chops are ready. 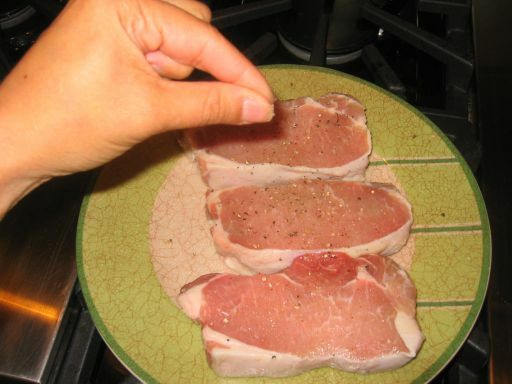 The pork chops are seasoned with salt and pepper. 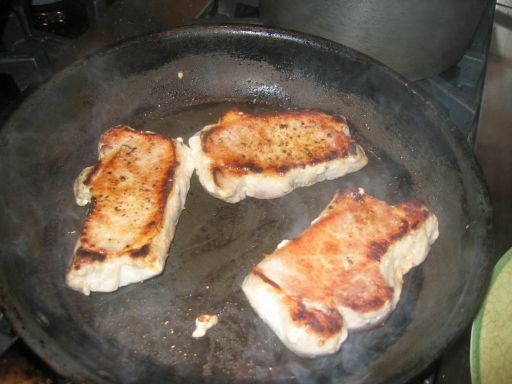 On a hot skillet I am browning the Pork chops until the top has caramelized. About 3 minutes per side. The first side is ready so I turned the pork chops to the other side. I use a thermometer to make sure that the internal temperature of the chops are around 150 to 160 degree. I am now pouring the sauce into a serving plate. 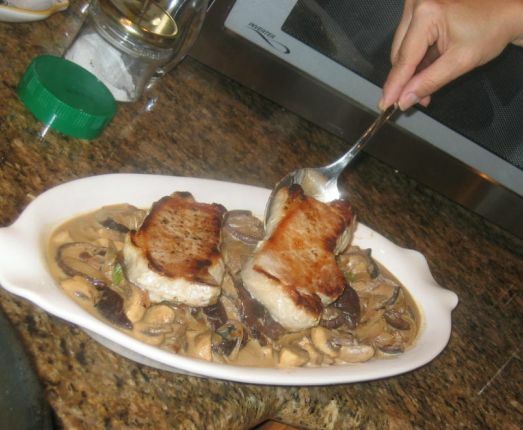 Adding the pork chops on top of the sauce and Dinner is ready!